Donors who wish to remain anonymous have pledged $3 million to fund an endowed chair in gifted education at Whitworth. The landmark gift recognizes Whitworth's commitment to preparing teachers who pursue a vocation in serving gifted and talented students and will support the university's Center for Gifted Education & Professional Development, which is the only one of its kind in Washington state. "We are so grateful for the generosity and vision of these wonderful donors," says Whitworth President Beck A. Taylor. "In honoring Margo Long, and in establishing the Long Chair in Gifted Education, these dear friends of Whitworth are simultaneously celebrating the university's rich history of academic excellence and helping us point to a promising future for our students and faculty. The establishment of Whitworth's fourth endowed faculty position moves us even closer to our goal of establishing 10 such positions by 2021." The endowed chair will be named in honor of Margo Long, who was a longtime associate professor of education and supervisor of secondary-level education students for the School of Education at Whitworth. Long also founded and was director of the university's Center for Gifted Education & Professional Development until retiring last spring. Long helped propose the Washington state specialty endorsement for teaching the gifted, served as member of the State Advisory Board for Gifted & Talented and was a member of a committee of the OSPI to examine meeting the needs of underrepresented K-12 gifted and talented students. She also received the Courage Award from the Washington Association of Educators of Talented & Gifted. "I am truly overwhelmed by this gift to continue what I believe to be one of the most important needs in our schools today: to train teachers with the skills to address the needs of gifted students," Long says. "This endowed chair is really a tribute to the entire Whitworth School of Education and all the people who have contributed to the Center for Gifted Education's existence and goals. It is a thrill to know that the center's influence will continue. We have so much left to accomplish with securing appropriate instruction and opportunities for our bright students, and we have really only started to authentically address the cause. This endowed chair is definitely the hope and possibility we will succeed." The Margo Long Endowed Chair in Gifted Education will allow Whitworth to hire a national leader in this important field, thereby assuring Whitworth's national prominence as a center of excellence in gifted education. "Margo Long has given Whitworth an outstanding reputation in the field of gifted and talented education," says Michael Le Roy, provost and executive vice president at Whitworth. "This generous gift perpetually ensures that Margo's legacy will influence many future generations of Whitworth students, and it creates the second endowed academic position in two years, indicating our donors' confidence in Whitworth's great mission. For this we give thanks." Whitworth established the Center for Gifted Education & Professional Development in 1979, in response to the growing need for leadership on the east side of Washington state to facilitate the distribution of materials and to provide services for the exceptionally able learner. Since state money was available at that time, public schools, particularly in rural districts, were eager to plan categorical programs and implement curriculum. These districts felt that their situations differed greatly from the large metropolitan districts west of the Cascades. Consequently, the Center for Gifted Education and Professional Development at Whitworth University was established to offer graduate courses and to provide in-service, consultant aid and other practical resources. Whitworth's center supports and develops policies and practices that encourage and respond to the diverse expressions of gifts and talents in children and youth from all cultures, racial and ethnic backgrounds, and socioeconomic groups. To this end, the center supports and engages in research and development, staff development, advocacy, and communication and collaboration with other organizations and agencies that strive to improve the quality of education for all students. In addition, the center's extensive library of current and classic gifted materials, including periodicals and major texts in the field, is a valuable resource for teachers in the areas of curriculum planning, classroom management, learning styles realization, and lesson planning for gifted children in all types of programs. The center is a vital part of Whitworth's School of Education, the mission of which is to prepare educators of mind and heart who are scholars, community members, effective practitioners, visionary leaders, and guardians who advocate for children and youth. 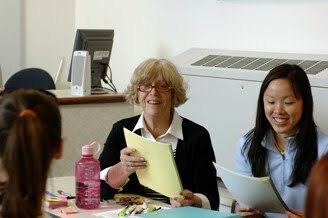 The School of Education provides its students opportunities to integrate theory and practice in diverse settings through the study of established and emerging content, as well as through pedagogical and professional knowledge. Whitworth University prepares educators to have a positive impact on the learning and development of those they are called to serve. "This very generous gift will honor the legacy of Professor Margo Long by assuring that Whitworth will continue to be a leader in the field of gifted/talented education and build on the work that Margo did for more than 30 years," says Dennis Sterner, dean of the School of Education at Whitworth. "The gift will allow the School of Education to advance the agenda in this field through the preparation of teachers, research and advocacy. Children and young people in Spokane and beyond will be the ultimate beneficiaries of this wonderful donation."